For over half a century The Basic Aluminum Casting Company has been a privately held, financially solid die casting company with a professional integrity matched by few in today’s industry. At The Basic Aluminum Casting Company, we bring quality die casting with delivery and pricing achieved through a sound business organization. Centrally located in Cleveland, Ohio, we’re easily accessible across the Midwest and the entire United States. Occupying over 55,000 square feet at our plant, Basic has serves the transportation and general manufacturing industries and beyond! The Basic Aluminum Casting Company can be best described as an engineering company with one simple trait – creating die cast products from listening and understanding our customer’s needs. A strong commitment to that and a focus on quality has enabled us to continue to be one of the best and oldest names in the industry. Basic Aluminum manufactures quality high pressure aluminum die castings. We utilize many different casting alloys to meet product and customer need. We also provide many secondary manufacturing services for our products. Other services include machining, painting, plating, assembly and testing custom products. Basic delivers a casting with the machining, finishing and assembly requirements that fits your application. We will work with your product team to provide a high quality, low cost solution for your casting. 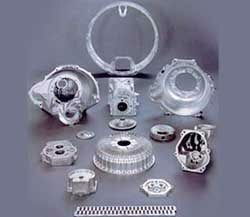 To that end, we have provided valuable information on die casting on our website menu. For potential buyers of die casting products, the process of transferring or building new tooling is included to get an idea of our process. We work with our customers to ensure that your project occurs smoothly, ensuring timely delivery of your casting that meets and exceeds your the needs! Basic Aluminum – since 1946 – serving those who seek the advantages of quality and dependability in die casting components.